I paddled the Fraser River from Fort Langley to Coquitlam for FraserFEST! I am new to canoeing, but I am registered to begin training with Nothin Dragon, a 50+ paddling team that trains in Port Moody, BC, close to where I live in Coquitlam. Being a director of the Hoy-Scott Watershed Society and I manage their social media pages, I try to keep in touch with other like-minded community groups. Last Friday, while winding up my work day, I received an email from Rivershed Society of BC about FraserFEST, a 3-week event created to educate on the Fraser River’s history, culture, and the issues threatening its health. The mighty Fraser is the longest river in B.C. The email advised that spots were still available on a 25 km canoe trip from Fort Langley to Coquitlam that coming Sunday. I thought, how perfect it would be to get a taste of being out canoeing, before I start with the dragon boat team in October. Within minutes I had registered for the Sunday morning event (even though my mother was moving in on Saturday night), and later on Facebook saw that they still had openings available, likely due to the foreboding weather, so I tagged my eldest daughter and encouraged her to join me, which she did. "It is no coincidence communities and cities are built on large and healthy waterways tend to also have healthier financial foundations with more abundance of wealth and prosperity to go around." A solid number of intrepid cyclists and paddlers showed up on August 20th at Colony Farm Regional Park, which is located on Kwikwetlem First Nations territory at the Coquitlam River, and served as host site for the Coquitlam festival portion. The forecast called for rain, winds and possibly lightening, but we were all geared up as 'west coast' people know how to, and were ready for an adventure. We were treated to coffee and yummy Uprising Bakery goodies. I was not aware this was the inaugural event, nor that cyclists would be joining us. They would be pedaling along a trail on the north shore of the Fraser as we made our way by water. The group was welcomed by Kwikwetlem Band Council member, Ed Hall, and founder of the Rivershed Society of BC, Fin Donnelly, who is also an environmental activist, and local politician. Donnelly is well known for swimming the 1,400 km length of the Fraser River twice, and was our excursion leader for the day. I had heard Fin speak before, and I introduced him to my daughter, asking him to tell her about his historic swim and the annual 20 day trip that he leads each summer providing young adults the amazing opportunity to travel down the Fraser River. Later, bikes were loaded into a transport vehicle, and we boarded the school bus to Langley. 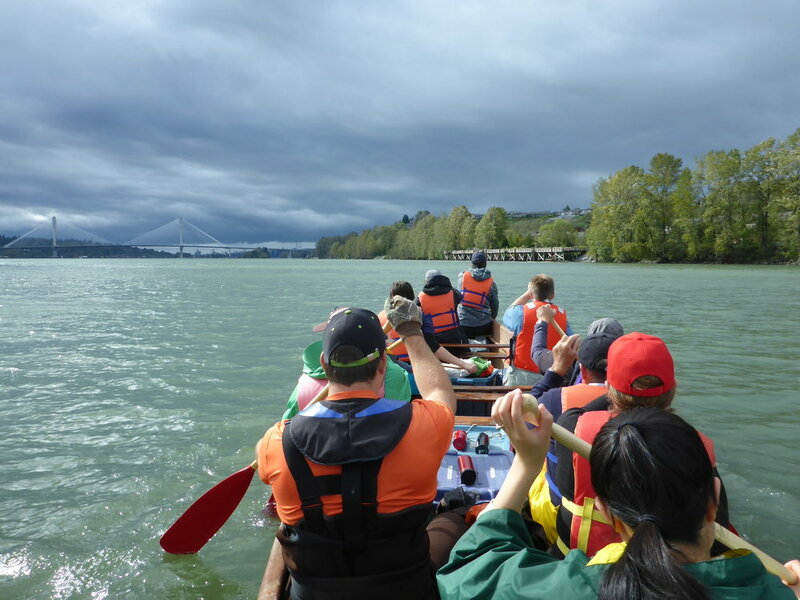 Being new to canoeing, I was a bit nervous about the weather, which worsened as we crossed the Port Mann Bridge. After meeting a few people on the bus, I learned I was not alone with those feelings. "FraserFEST’s goal is to increase watershed awareness of those who live, work and play in the Fraser River Basin, through river adventures and community festivals blending music, art, speakers, food and culture..."
In Langley we were greeted by Wendy Dadalt, Manager, Metro Vancouver Regional Parks. Bikes were offloaded, and cyclists mounted up and were on their way along the 25 km trail beside the Fraser. The rest of us were traveling by canoe, and we were joined by Jay Lundy of Voyageur Adventures, who expressed that the canoe is a symbol of Canada's culture. He spoke of the early years and spirit of Canada, and how we still rely on our waterways, to connect us, providing us food, energy, and enjoyment. "As Canadians, we are diverse and we are explorers," said Jay. It made me think of my Canadian-German grandfather, who was a Hudson's Bay trapper. I wondered if he ever went by canoe when he would head out and lead trapping exhibitions in the 1940s. I bet he did. My trapper grandfather Heintz married a Metis woman, and I noticed Jay Lundy wore a Metis sash on his hat. Jay made sure we were educated on the basic canoeing strokes, and showed us how to do a 'voyageur salute' with our red paddles, which was fun. Amid a heavy rain, we got seated in the 34’ voyageur canoe which are built in Alberta. I sat up front behind Fin, and my daughter Loryn was behind me with Michael, a young member of the Kwikwetlem Nation, who has just moved up from the USA and was also new to canoeing. He was honoured to be with us and his people had given him a special Kwikwetlem paddle to use for the journey. From historic Fort Langley, with Fin leading as stroker, and Doug at the back as our steerperson, our 12 member group got underway! Our aim was to keep in unison, but it did become tricky at times, especially as arms tired. With Fin in front of me, and setting a pace that never waned, I did my darnedest to keep up with him, and I feel I did a pretty good job over the 4 hours. There were moments when I'd get into the strokes, and my mind would wander, and then I'd snap back to reality, finding I'd lost the group's rhythm. We were encouraged to take breaks when we were tired, or get water, take photos, etc. The large canoe felt extremely safe, and hardly tipped sideways, event when we were met with choppy waters. On our journey we paddled past Barnston Island, under the Golden Ears Bridge and by Douglas Island to the mouth of the Coquitlam River. The weather changed many times, and we saw eagles and seals. When we stopped for lunch at a camping area, we watched a log boom pulled by 5 tugboats go by - a scene common to the Fraser. The cyclists who were well ahead of us, waited for us to catch up at a dock along the trail, and it was so nice to see them. They waved, cheered us on, and took photos as we saluted them with our paddles. After 4 hours we were elated to finally turn in, and head up the Coquitlam River into Kwikwetlem territory, where we were greeted by those we'd seen earlier in the day, as well as many newcomers. We helped hoist the canoe from the water, and then formed a circle as we were officially welcomed back by Kwikwetlem Nation. Each of us were given flags to carry into the festival area, where we enjoyed a hot meal of salmon lasagna from Pasta Polo. The sun came out over the festival grounds, as well as a rainbow, and along with others, we enjoyed live music, a variety of speakers, and educational community booths. Words were offered by Founder, Rivershed Society of BC, Fin Donnelly, MP, New Westminster- Coquitlam & Port Moody; Selina Robinson, MLA Coquitlam-Maillardville; Mark Angelo, Founder, BC Rivers Day / World Rivers Day; Bonita Zorillo, Coquitlam City Councillor; and Ed Hall, Kwikwetlem Band Council. "Our early forbearers held many festivals to give thanks to the land and the rivers from whose bounty they thrived. The Fraser River is still one of the largest salmon producing rivers in the world. FraserFEST will culminate with World Rivers Day, the last Sunday in September. Participants are invited to come celebrate the watershed in which they live while enjoying local entertainment and food." - Rivershed Society of B.C. There are three more festivals planned this week, in New Westminster Quay on September 24th; in Vancouver at False Creek Fisherman's Wharf on the 26th; and the final one in North Vancouver at Cates Park on Sept. 27th. FraserFEST will be held annually. Listen as Fin Donnelly speaks about FraserFEST to our group that morning.